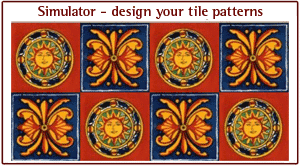 Set of ten tile designs - 30 T.. The thirty pieces set of the tiles (10 designs, 3 tiles of each design) measuring 10 cm x 10 cm will allow for covering a square metre of the surface. The tiles are abrasion-resistant and even with deeper scratches the pattern is still visible because the colours are incorporated in the glaze. Each tile is first covered with an undercoat – brown colour, and then each colour is laid separately according to the design. After burning, the tiles obtain their final colours as well as high resistance.